This is a family-run hotel with a friendly atmosphere and is well located for all the facilities this resort has to offer. It provides a relaxing setting, with shops and restaurants nearby. we could find no fault with the aloe.the room was basic[no different to other hotels we have stayed in]balcony was a decent size we had a side sea view.cleaned daily.food was ok.staff friendly,location excellent plenty pubs left and right of hotel the cheapest being to the left never stopped in for the entertainment.this was latest we have come to cyprus and found the clientele to be on the older side so there were plenty of sun beds could be different in mid summer.best part of the holiday was a jeep safari,chris our driver took us to see his family in the mountains and the village elders who opened up the church for us to look at[the real cyprus priceless]would we go back yes. and can honestly say I will not be going back there. 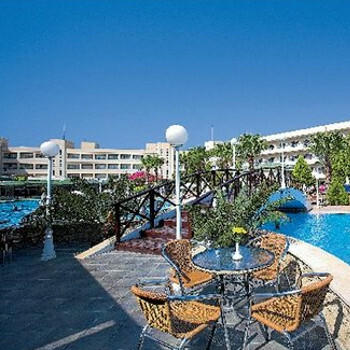 I have stayed in Paphos many times in different hotels/apartments/villas and on this occasion decided to stay at the Aloe as the reviews I read on this site were OK and Thompsons gave it a 4T rating. I knew the location and have stayed nearby the Aloe in the past and it looks a decent hotel on the exterior.Until you go through the doors. Dark,dismal lobby. Our room was seaview(the only good thing about it) and the furniture was old,tired and grubby.Mould on the bedside lamps and curtains.Dirty carpets(my grandsons feet were black from running around the room with no sandals),spring on side of mattress breaking through,broken/taped up tv remote,cot from the 'ark'. Bathroom was not bad.Shower was faulty but got that fixed.Towels were changed everyday. Can only repeat what other people have said about the safe/mini bar. No tea/coffee making facilities,one English speaking tv channel. Breakfast was OK but as soon as it is 10 am thats it. The tiredness extends to outside especially the childrens play area which was overgrown with a hole in the side hedge which led into the field next door.Not very secure. Entertainment non existent and one large lobby area to sit in with a tv in one section and small shop. Didn't eat in the hotel so cannot comment on the food. Plenty of good restaurants within 5-10 min walk. If you stay here don't expect 4 star.More like 2. The cleanliness of rooms and all other areas was excellent. Don't use fridge as you will get charged for it. Particularly liked clean towels every day and the provision of towels for the pool. The buffet breakfast was available for three hours and the food excellent with very good choice. Tables were cleared instantly. Only ate once at night in the hotel, a BBQ round the pool. Again, the choice was very good. Only a small gripe really, not much good if you want evening entertainment. Hotel is only a 15-20 minute stroll to the harbour, beware the dodgy pavements though. All in all a comfortable, relaxing place to stay. hotel reception and staff very freindly and helpful would rate this as four star, rooms very basic and only rate as two star, if you leave the air con on all day bed feels damp, if staying for two weeks go half board first week and bed breakfast second week and eat out, food not very good as it is repeated,as stated in other reveiws if you use the fridge you will be charged, if you want to use it ask reception to empty it and then you can fill it, if you go in school holiday as we did be prepared to be down at the pool for 6.30 to claim your sunbed. notices at the pool side say that you cannot reserve sunbeds but nobody took any notice, dont be afraid to move sunbeds and parasols to other positions, excellent pool for kids. The hotel was 1st class. It was strange finding out that 80-90% of the guests staying in the hotel were senior citizens from the UK. However this was for the good as we both knew that the food would have to be of a very high standard to please them and we were not disappointed. The breakfast is held over a 3 hour period and it is just a matter of helping yourself to whatever type of buffet breakfast took your fancy with the staff removing dishes whilst you went for your next helping. The same appied for the 3-course evening dinner and each nigh had a different theme but all producing the same high standard and choice. I personally could not get enough of the banana ice-cream which was lovely. The hotel rooms are very clean and the outside swimming pools and surrounding area was big and very clean with no shortage of sunbeds. Only downside was the lack of tea facilities in the bedrooms, the charge for safety deposits keys for the room safes and the charge of Euros 2.50 per day if you were caught using the minibar fridge to cool your own drinks or food. The bar lounge sells plenty of cocktails and beers at Euros 3-5 each and the lunch menu (used once beacause of departure times) is as good as the dinner menu.The hotel will charge you a daily rate should you use the minibar for your own drinks or food so be aware. Also they charge for the use of the room safe key. They provide large towels for daily use at the pool which does help resolve the problem of too much luggage. Travelled with Mercury to this hotel. Had a seaview single room. Have been to this hotel on numerous occasions and will definitely return in the future. I couldnt fault this hotel.We stayed for one week over Christmas and were well looked after by the hotel staff. Nothing was too much trouble. There was entertainment at the hotel if you didnt want to go out in the evening. We will go back but definatley not in the summer. A nice winter resort for us. This hotel offered everything you could need. The hotel is ideally situated for getting into resort for an excellent choice of restaurant. The rooms are fine, we stayed road side of the hotel which would have been loud without air con , but we slept like logs beause of it. The pools were great, the bar relaxing and the lunch at the pool bar fine. we would easily retrn here and have nothing bad to say. Cyprus is expensive but probably good value for money. I would recommend this hotel. We stayed B & B and the food was varied and plentiful. Our room was large and very clean with air con. The location of the hotel is fantastic. it is only a couple of minutes walk to the bars and shops and 15 minutes walk to the harbour. It is so busy if you stayed for a month you wouldn't have enough time to sample all the bars and restaurants. The pool was one of the best I have seen.There was never a shortage of sun loungers but we went in term time, I don't know if it would be like that in the holidays.The hotel entertainment was dire, but being so close to everything you don't need to sit through it.I would definitely visit the Aloe again!